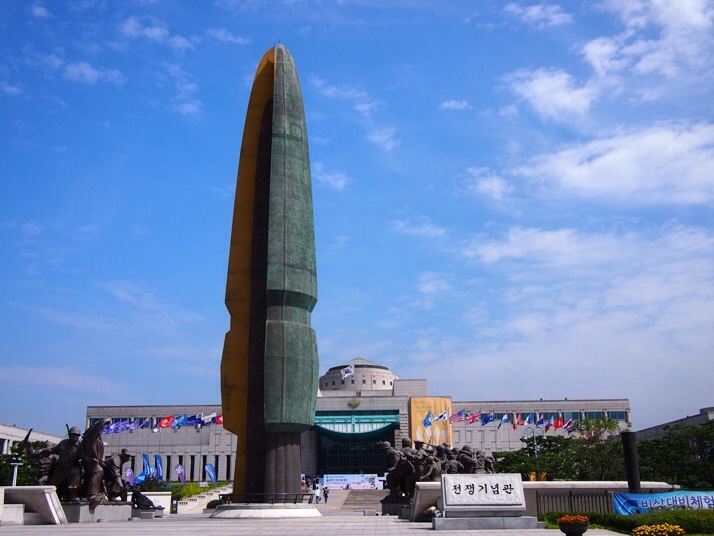 Despite its name the War Memorial of Korea is more a museum of war than a memorial, although there are a few monuments in front of the museum building. 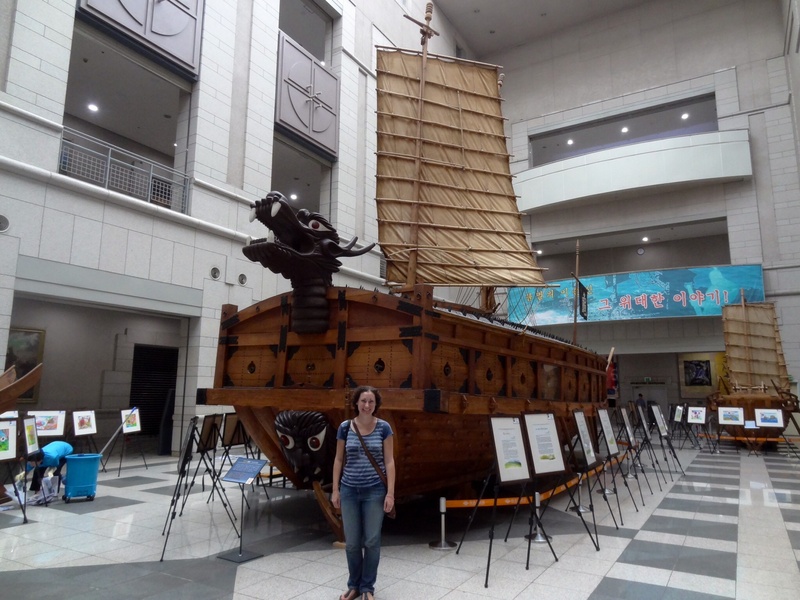 The museum is huge and begins with a history of war and weaponry in the Korean Peninsula from prehistoric times through to the early 20th century, including a rather nifty device called a Hwacha for firing 100 rocket-propelled arrows at once and a 1:2.5 replica of Admiral Yi Sun-shin’s battleship which lead the Korean Navy defeat of the Japanese in 1592. 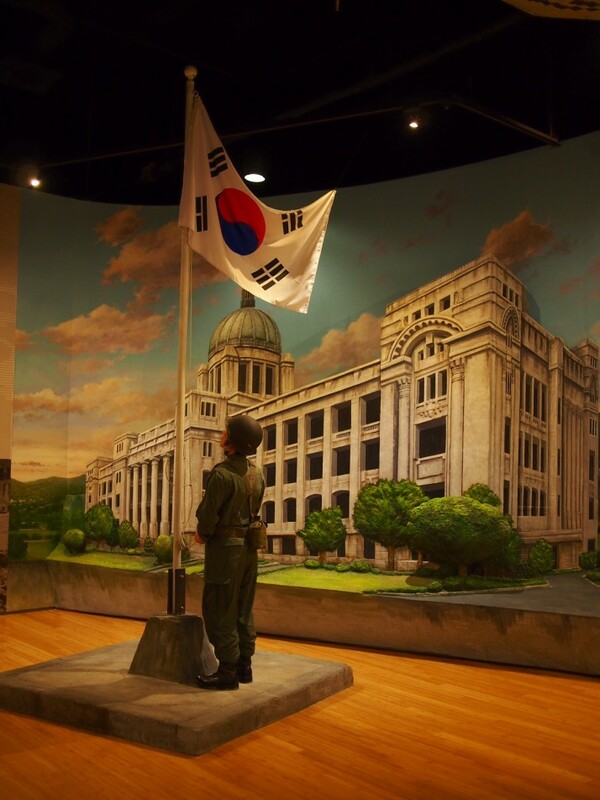 However, most of the exhibition space is given over to the Korean War. Similarly to the Vietnam War, its name in the land where it was fought is not the same as the one we use – the South Koreans know the conflict as the 25th June War after the date when the North Korean troops invaded. 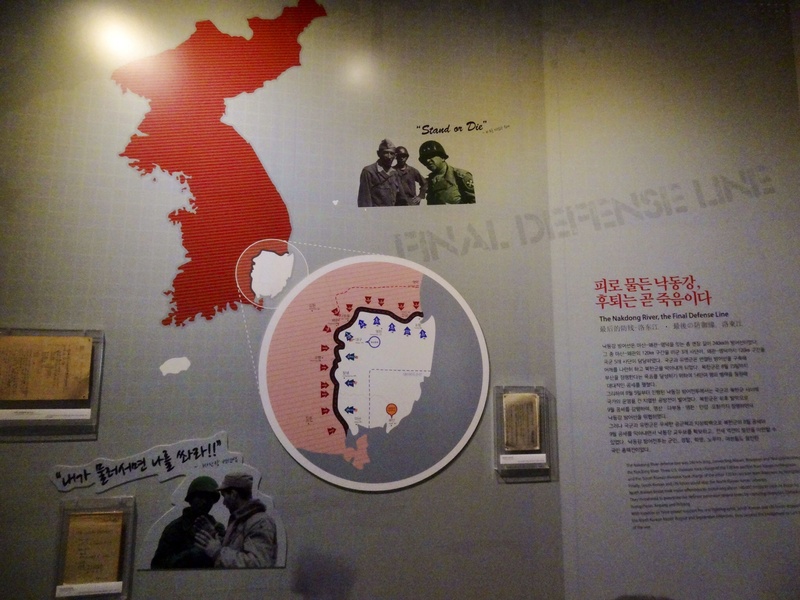 The displays follow the war’s progress chronologically and expanded on what we had learnt at the UNMCK in Busan. The South was completely unprepared for and surprised by the invasion from the North whose troops had been in training for months. Within 3 days they had taken Seoul and just weeks later had conquered all but a tiny corner in the south-east of the country around Busan. At this stage, the UN forces were fully deployed under the leadership of American General MacArthur and executed a counter-offensive at Incheon near Seoul to regain the capital and thence by pincer movement push the Communist troops back northwards. They were almost at the Chinese border, having captured most of the northern territory, when Kim Il-sung called on Mao for assistance from China and in desperately cold (-30 degrees) conditions the UN forces were forced to retreat as the Chinese Army joined the conflict. After a little toing and froing around the area which is currently demarcated as the border, a stalemate was reached and an armistice signed although technically the war has not ended. 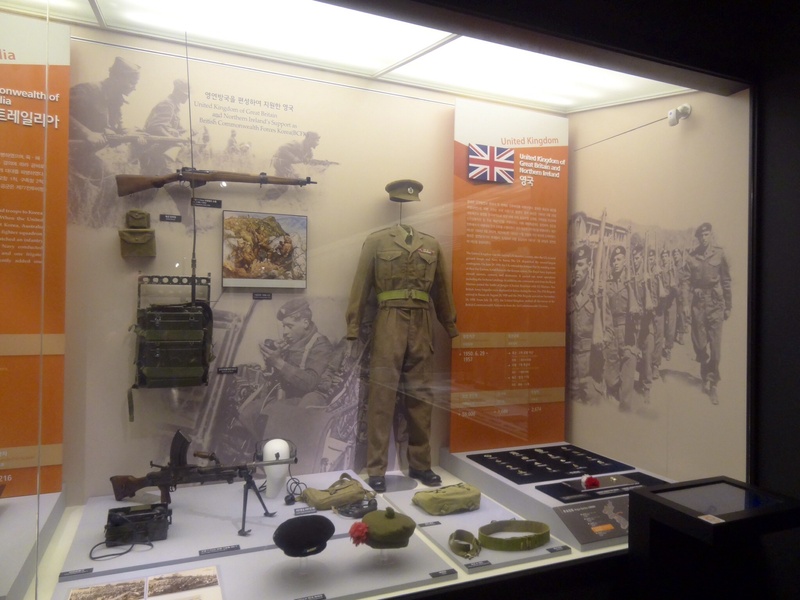 The usual museum type displays were punctuated with several audio-visual items including two ‘4D experiences’ which were essentially like war based theme park rides. They didn’t necessarily add much to the information we learnt, but definitely provided a nice change of pace. The first simulated the landings at Incheon with a 3D display and moving seats which made us feel as though we were aboard a boat in the harbour – not one for those who suffer from travel-sickness. The second was for me less successful, trying to replicate the bitterly cold retreat from the extreme north complete with an icy AC blast and 3D light show ‘blizzard’. The final Korean War exhibition room commemorated the UN forces and reiterated what we had learnt in Busan. It included this case of artefacts and information board of statistics for the UK’s participation. 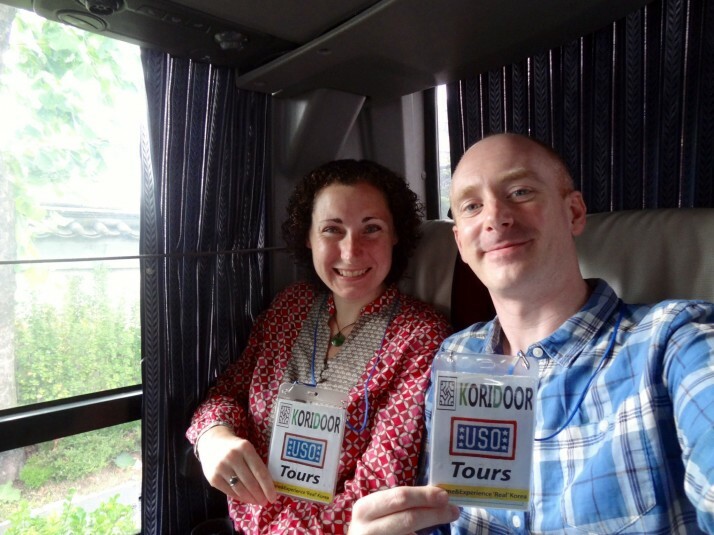 It took just an hour on the bus to reach the Civilian Restriction Zone where the list of names and passport numbers previously provided to USO were checked by ROK (Republic of Korea, aka South Korea) soldiers and we were waved through. 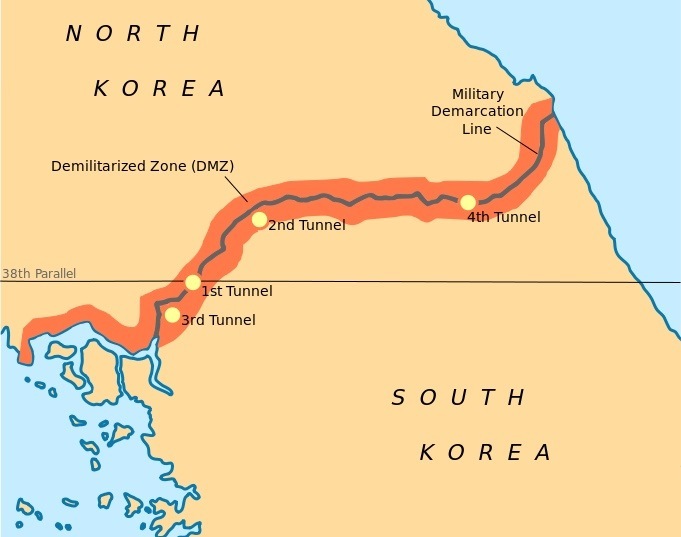 This is not the edge of the DMZ but an additional buffer that South Korea maintains, I suspect as a safety precaution so they don’t have lots of unaccompanied tourists wandering over the boundary lines into the minefields. 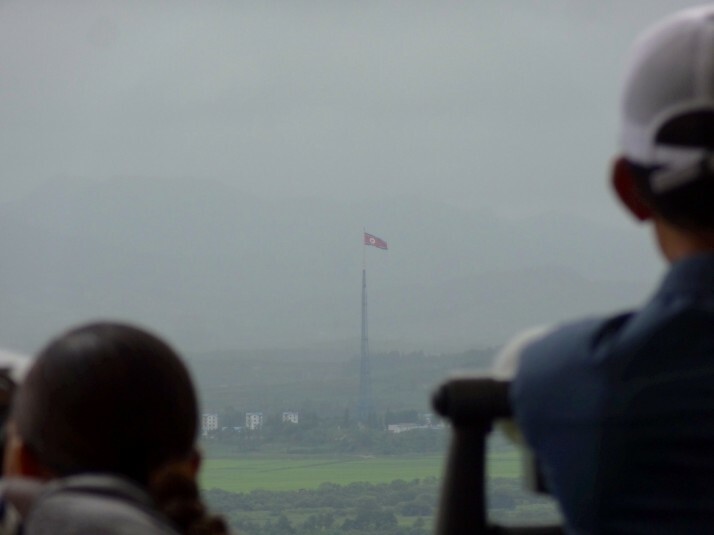 Once inside, our first stop was the Dora Observatory, an observation deck overlooking the DMZ. inside the DMZ on the northern side is Gijungdong, the ‘Propaganda Village’, with the third highest flag pole in the world and a massive North Korean flag with a dry weight of 60lbs, so heavy that it has to be taken down in inclement weather so that it doesn’t rip under its own weight. The village’s name comes from the rousing messages that used to be broadcast from loudspeakers there for large portions of the day. In fact the buildings are just a facade, empty shells with no actual inhabitants. The Gaeseong Economic Area, a surprising and heartening story of collaboration between North and South employing around 700 South Korean workers (largely in managerial positions) and 50,000 North Korean workers manufacturing electronics, clothing and watches. The advantages of cheap labour for the various South Korean firms involved and much needed economic input for North Korea ensure a mutually beneficial outcome. Taesongdong, the ‘Freedom Village’ on the southern side of the DMZ with a slightly smaller but still enormous flagpole has around 200 inhabitants guarded day and night by the UN and ROK forces. As the village is technically not in South Korea they are not required to pay tax on the money they make from their crops and the men are exempt from National Service. They are wealthy compared to the average South Korean farmer although life in the village must be very restrictive and there are rules for who can live there. a GPS blocker on the northern side prevents TV and radio signals from the South reaching across the border. 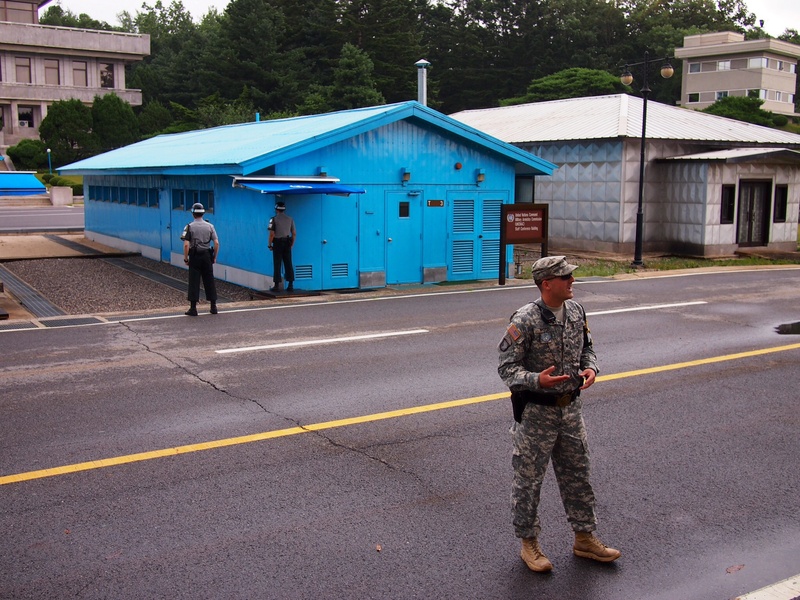 A side effect is that it disrupts mobile network signal for visitors to the DMZ. After the presentation we were free to go to the outdoor platform and feed the binoculars with ₩500 coins (£0.30) to get a closer look at the North Korean side. Photos were allowed behind a thick yellow line about 3m back from the edge so that you could hardly see anything, especially with several busloads of people in front of you, but with a bit of zoom we managed to take a couple of pictures and Andrew got a few sneaky ones from the platform’s edge too. Next stop was the ‘3rd Tunnel’. Found in 1978 by the South Koreans (the third of four found so far, hence the name), it was dug by the North Koreans as an invasion tunnel, it is rumoured that there are quite a few more which remain undiscovered. There were electrical issues when we arrived, probably due to the pretty much constant rain that had been falling for the week prior. Because of this we were able to walk down the long ramp to the tunnel entrance but not take the usual trip into it. 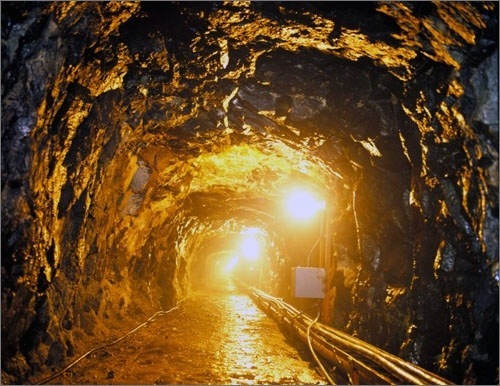 At the bottom we saw holes where the dynamite had been laid to blast the tunnel, black paint on the walls (the North Koreans’ cover story is that they were looking for coal…) and the ends of the PVC pipe boreholes which the South Koreans sank to find the tunnel. At the bottom of the ramp we noticed a spout and drinking cups with a sign announcing ‘DMZ spring water’, we had to give it a try! Halfway back up the ramp there was a bit more excitement as the lights went out and for a couple of seconds before the emergency lighting came on it was pitch black! Making our way to the top in semi-darkness we saw a long queue of people waiting to go down and speculated that perhaps visits had been stopped until the electricity came back on – I think our timing was lucky. 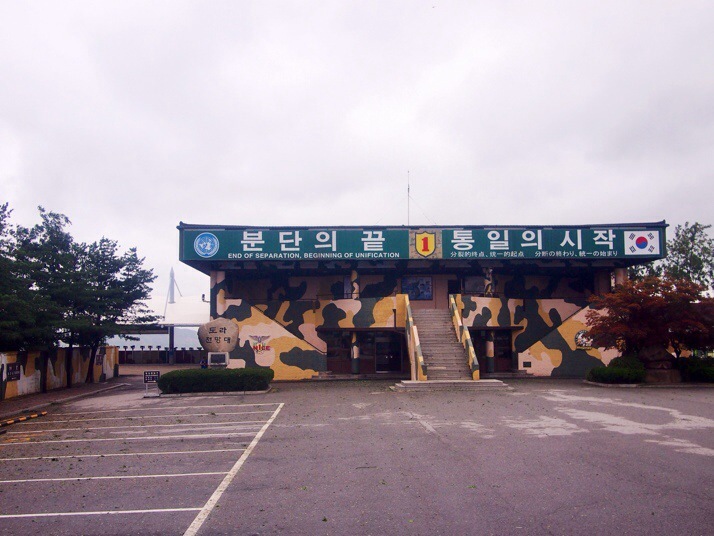 After lunch and a quick look around Dorasan Station we made the short hop to Camp Bonifas, the US Army base at the edge of the DMZ and the entry point to Panmunjeom, or the Joint Security Area (JSA). 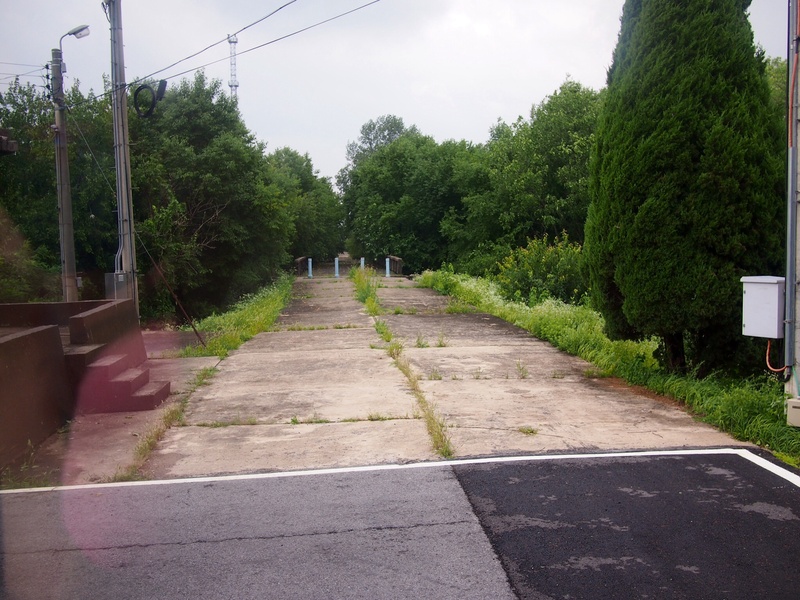 This is where the armistice agreement was signed on July 27, 1953 and nowadays is the area in the DMZ where any talks between the two sides take place. It’s also a tourism destination from both sides (we know someone who has done a similar visit on a trip to North Korea). Our guides (and guards) for the day were US soldiers Specialist Wood, Private Barnhart, and their boss, 1st Sgt Bailey. 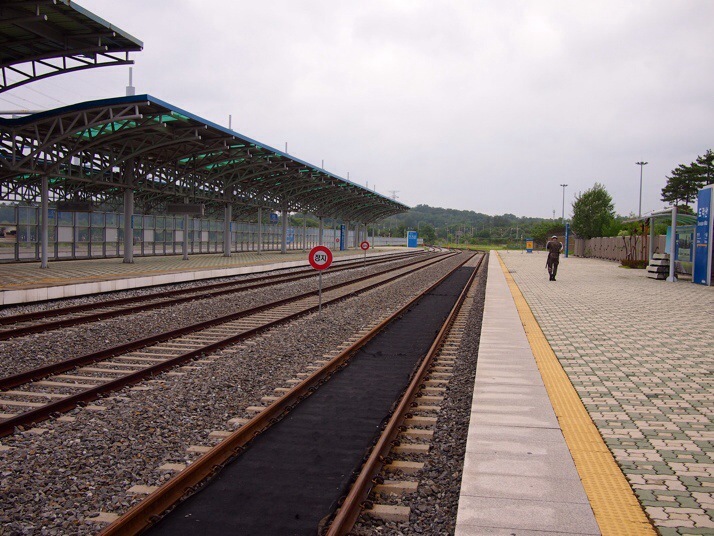 Railway tracks running towards Pyeongyang at Dorasan Station. Its tagline is ‘the first station toward the North, not the last station from the South’ and eventually it is hoped that it can connect into the Trans-Siberian Railway, linking Korea to the rest of Asia and Europe by rail. We signed another disclaimer, this one was more focussed on behaviour within the JSA including no form of engagement or communication with any North Korean soldiers, no gesturing or pointing of any sort towards North Korea and generally being on best behaviour so there was no chance of photos or video from the other side showing the UN in an unfavourable light. For similar reasons, the dress code is strict – no T-shirts without collars, no sleeveless tops, no short shorts or skirts, no sandals. The USO tour rules were very emphatic about this and fortunately all of our group were deemed to be suitably attired. 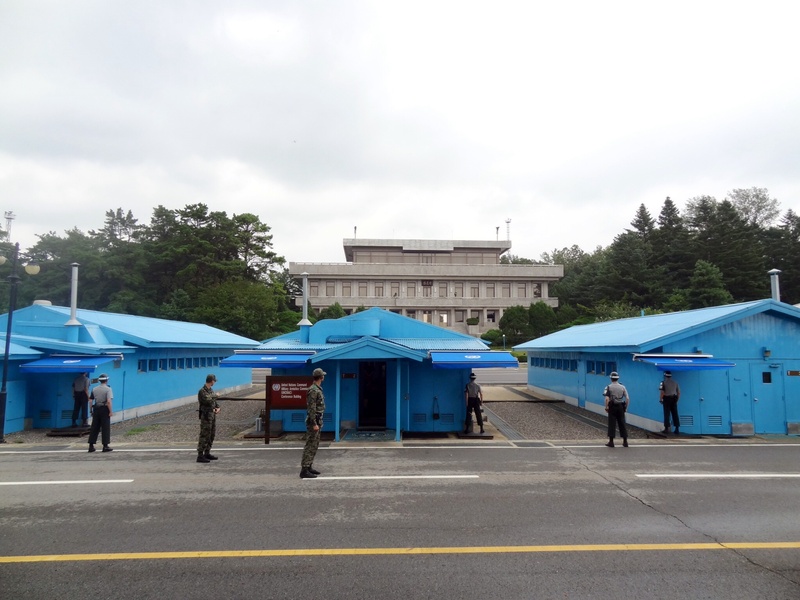 An army bus drove us from Camp Bonifas to the JSA where we were told to form into two lines before we walked through ‘Freedom House’, the South Korean’s main building here, to ‘Conference Row’ where the cross-border buildings are situated. 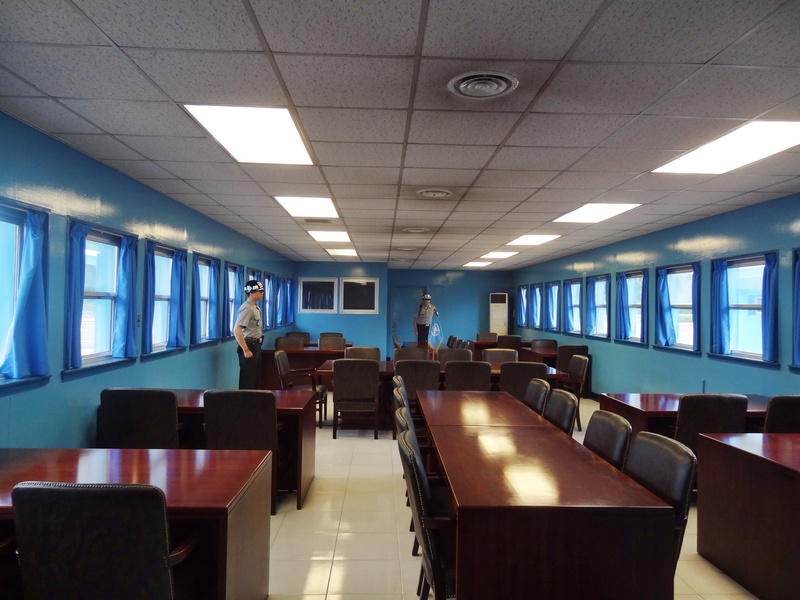 Once we’d entered one of the small concrete buildings and gathered around the central table, Specialist Wood told us that the table was placed over the border so half the group was technically standing in North Korea! There to guard us were two ROK soldiers in a modified Taekwondo stance and dark glasses to make them look more intimidating. Neither of them moved a muscle while everyone shuffled around to have their picture taken near them, the Korean equivalent of the guards at Buckingham Palace. It was all a little surreal, on the one hand very serious, surrounded by soldiers on high alert, and on the other taking photos as if we were in front of a normal tourist sight. Back outside on Conference Row, Specialist Wood gave us some more information and pointed out a single North Korean soldier who he called ‘Bob’ standing out on the steps of the main North Korean building in the JSA, ‘Panmun Hall’. 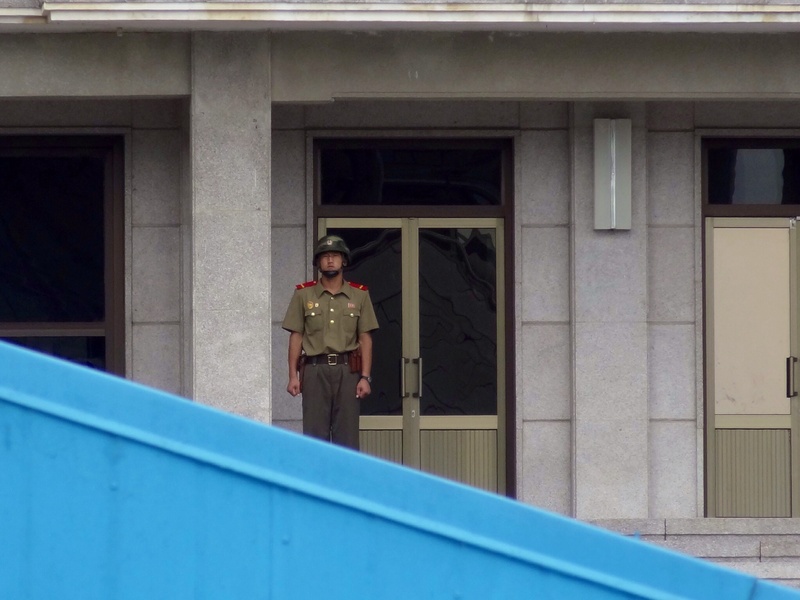 He was the only North Korean that we saw although we were assured that they were watching us. From Conference Row the bus took us back past a memorial for two American soldiers killed in the JSA by North Koreans in 1976, an event known as the Axe Murder Incident. Also the ‘Bridge of No Return’ where POWs from both sides were given the option to cross after the armistice was signed but with the understanding that there would be ‘no return’. In practice however quite a few North Koreans make it to South Korea each year though mostly via China, not through the DMZ. Our USO guide told us that they are welcomed with open arms and set up with a house and job as well as being invited to tell of their ‘terrible’ experiences in the North on TV. We thoroughly enjoyed the tour to the DMZ although we were mindful to remember that everything we were hearing was from the South Korean perspective. Not that I suppose for a minute that North Korea is a blissful place to live, but I don’t suppose the DMZ villages are called ‘Propaganda Village’ and ‘Freedom Village’ over the border either. It should also be remembered that this is all politics, largely caused as far as I can see by rivalries between the US and the then USSR after WW2. Many Korean families were split with members on both sides of the dividing line and no way to stay in touch, so as far as they are concerned a unified Korea would be the ideal solution. Unfortunately, I think that 60 plus years of division will take quite a lot of untangling before unification is possible. 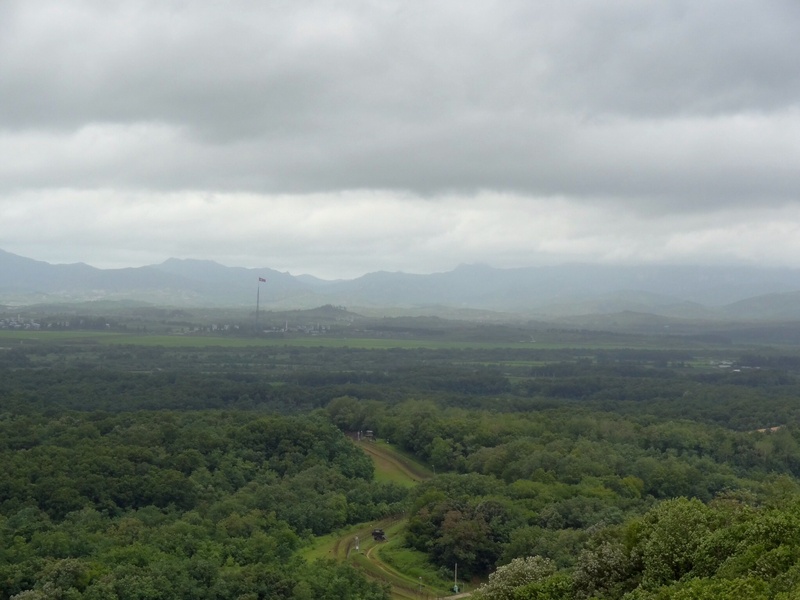 To end on a positive note, as the DMZ is so untouched by humans, and despite the land mines, it is a paradise for wildlife and several endangered species are known to live there. 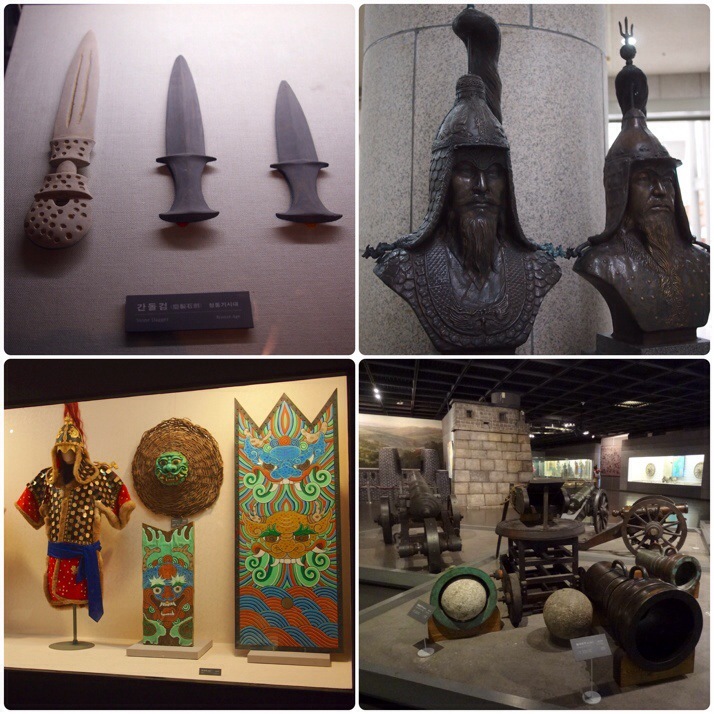 This entry was posted in Experiences, Places and tagged Museum, Seoul, South Korea on August 4, 2014 by Julie. 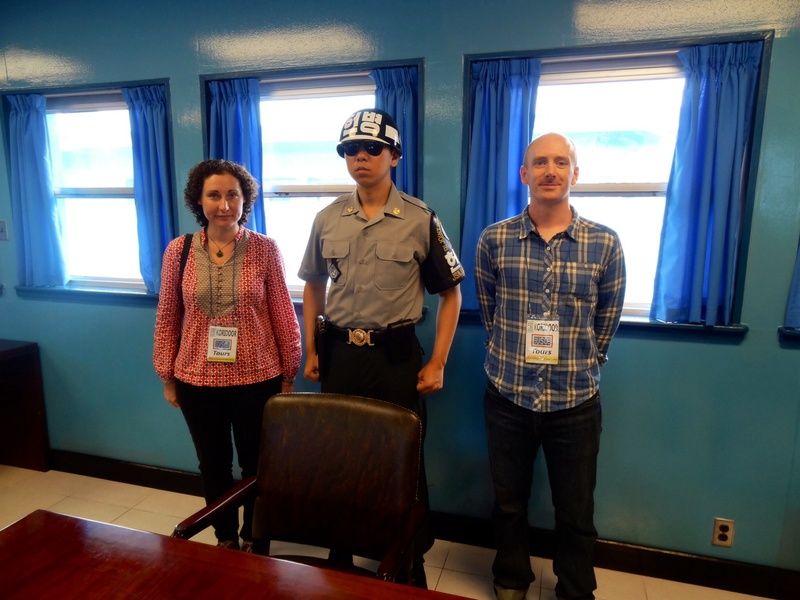 It was great to meet you on the flight to Shanghai, and those links are an enlightening read about real life in North Korea.. Fascinating account of somewhere I’ve read little about (largely because there’s so little unbiased stuff to read). Great photo’s and very informative too; thank you both so much. Thank you. You might find the links in Emily’s comment interesting, they’re online Q&A discussions hosted by North Koreans who escaped. The first one especially with a young woman who escaped in 2010 is quite eye-opening about what life in NK is like. Can i know which site or tour agency arranged this tour for you guys ? I liked the flow and its very comprehensive Thanks so much ! What is 25 + 7 ?